My daughter informed me today that we have not made cookies in a loooong time. She wanted Chocolate Chip, but there were no chocolate chips in the house. A sleeping baby meant we couldn't go to the store. 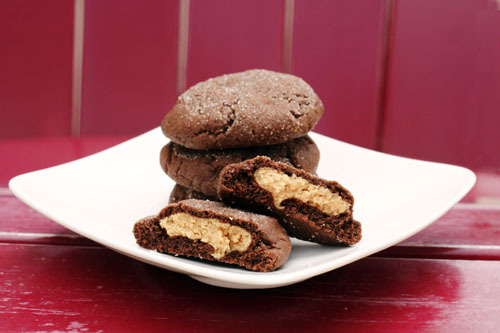 So after a quick look through my recipe box and the pantry, we decided on Magic Middle Chocolate Peanut Butter Cookies. I found the recipe a few years ago, but never got around to it. Boy am I glad we were out of chocolate chips. These are unbelievably good. I had to share. In a bowl, mix flour, cocoa and baking soda, until well blended. In a larger bowl, beat sugar, butter and 1/4 cup peanut butter until fluffy. Add vanilla and egg, beat. Stir in the flour mixture until blended. Set aside. To Make the Filling: Combine confectioner's sugar and 3/4 cup peanut butter, and mix well. Roll the filling into 25-30 - 1 inch balls*. I used a small cookie scoop to keep things uniform. For each cookie, flour your hands and shape about 1 Tablespoon** of dough around 1 peanut butter ball, covering completely. I used a cookie scoop for the cookie also. Once the cookies are "stuffed", roll them in the palm of your hand to make a smooth ball. Then roll them in sugar. Like you would a snicker doodle. Use the bottom of a glass to flatten the cookies, slightly. Bake at 375 degrees for 7-9 minutes. When the cookies are done they should be set and slightly cracked. *We found that putting the peanut butter filling "balls" in the freezer while you prepare the cookies helps. Just a few minutes makes them easier to work with. ** I ended up using a little more than 1 Tablespoons of dough for each cookie. ***If your children are working with you, it might take a little longer to get things put together. If the dough starts to dry out, add 1-2 tablespoons of milk. These cookies are fantastic. They take a little more time than chocolate chip, but it is worth all the effort. Try them, you can thank me later. HAVE YOU MADE COOKIES AT YOUR HOUSE LATELY? DO YOU HAVE A FAVORITE COOKIE RECIPE? DO SHARE. I love making cookies with my kids such a great activity. These are my favorite EVER but warning you cannot eat just one and they are not "good" for you by any means. http://allrecipes.com/Recipe/Oatmeal-Peanut-Butter-Cookies-III/Detail.aspx Enjoy! These look delicious. I will put them next on my list to make. What a fun idea. Kids would love to do this also. Be sure you come back and let us know which ones turn out the best. I found this recipe and am planning on making it tomorrow. I'll let you know how they turn out. I use whole wheat pastry flour here, but you can substitute unbleached all-purpose flour if you like, or if that is all you have on hand. You might also add-in some finely chopped crystallized ginger, chopped raisins or currants, or wheat germ. You could try barley flakes or spelt flakes in place of the rolled oats. There are lots of different ways to take this cookie. Preheat your oven to 350F degrees, racks in top and bottom third. Line a couple baking sheets with parchment paper. Finely chop the chocolate bar into 1/8-inch pieces, more like shavings really. Try to avoid big lumps and chunks, which make flattening out the cookie dough later more difficult. In a mixing bowl, whisk together the flour, baking powder, baking soda, salt, oats, walnuts, and shaved chocolate. Set aside. Using a mixer (or by hand) beat the butter until fluffy. Beat in the sugar and mix until it is also light and fluffy. Scrape down the sides of the bowl once or twice. Beat in the molasses, then the egg, mixing until both are well incorporated, scrape down the sides of the bowl once or twice. Beat in the vanilla. Add the flour mix and stir by hand until the ingredients barely come together into a uniform dough. I like these cookies tiny, barely bite-sized, so I scoop out the dough in exact, level teaspoons. I then tear those pieces of dough in two before rolling each 1/2 teaspoon of dough into a ball shape. Place two inches apart on your prepared baking sheets. Gently flatten each dough ball into a thin, round patty with two fingers and then sprinkle the top of each cookie with a pinch of large-grain sugar. Bake for 7 minutes or until cookies are golden and fragrant. Remove from oven, and cool on a wire rack. Makes about 12 dozen tiny, bite-sized cookies. Thanks for stopping by. Let me know how the recipe turns out. It looks great. Perfect for little hands. We are so excited to see you this weekend. Drive safe. hi there. i'm not sure how i came across your blog, but i have you in my reader and check you out daily. anyways, i'm 8 months pregnant and am NEEDING (not wanting) some yummy chocolate cookies. so i'm excited to try this out right now. :) but i think there may be a mistake in typing perhaps? i thought 1 1/2 c. of cocoa powder seemed like a lot and so i googled the cookie and saw some recipes where it called for 1/2 c. did you do 1 1/2 c. or 1/2 c.? anyways, thanks for all your posts. they are great and helpful. Congratulations on the upcoming baby. Thanks for reading Family Volley. I have had this recipe filled away for a long while. I don't remember what we did last week. My daughter did the cocoa. :)It does seem like a lot. I will do some research and see what I can find. Emily, just went back to my original recipe. I have 1/2 a cup. Sorry for the typo, I just fixed it. Oh my Heavens. These sound amazing. They will be our FHE treat tonight! Thanks for stopping by my blog for Train Tuesday. I'm following back. Oh glory, this looks delish!!!!!!!! Too bad for me I printed this recipe off and made it a week or so ago before the cocoa measurement was corrected. I was coming back to check if it had been corrected. I thought "Maybe it needs so much cocoa to fight against that peanut butter" but when I got to the end of the recipe and my dough was far from cookie dough consistent I knew what had gone wrong. I just added milk as per your tip until I got it feeling right, about 1/2 cup. They turned out strong on the cocoa but still good!